What are the best tools for tracking keyword rankings? You’ll see posts listing dozens of different rank tracking tools. And, while a lot of the posts are comprehensive, you often leave paralyzed by all the options. (i.e. you realize how many tools are available to monitor keyword rankings, but don’t know which one is actually the best for different use cases). So, how do you cut through the noise and find the best rank tracker that provides this level of analysis? What is your favorite tool for tracking keyword rankings? Why? Respondents listed their top tool, and explained which specific features provided the most value for their business and/or clients. The votes were tallied and used to create the leaderboard below. Whether you’re looking for a standalone rank tracker, or one that is part of a broader SEO toolset, this post will give you a shortlist of field-tested tools to consider. Honorable mentions (1 vote): Authority Labs, SERPWoo, Pro Rank Tracker, SERPWatcher, Conductor, BrightEdge, SEO Powersuite, Microsite Masters, PlacesScout and SmallSEOTools. Note: SEMrush was also voted the #1 keyword research tool by 133 SEO practitioners. Now, let’s take a closer look at the three rank tracking tools with the highest number of votes. Here’s a closer look at the three tools sitting at the top of our leaderboard. What are the stand-out features of SEMrush, Ahrefs, and AccuRanker. SEMrush is an all-in-one SEO toolset for marketing professionals. Its main selling point has always been its competitor analysis. So it’s no surprise that you can monitor competitors in the Position Tracking tool. Although some experts would like to see the UI improved, SEMrush was still the top choice with 23 votes. Ahrefs is also an all-in-one SEO toolset. Better known for its backlink analysis (15 trillion links in their database), the tool has evolved a lot over the last two years to provide strong keyword analysis and rank tracking functionality. Some experts stated the rankings data in Ahrefs is not as accurate as SEMrush. But with 19 votes, it was a close second in our poll. Filtering options – tags, device, location, position, competitors etc. Unlike SEMrush and Ahrefs, AccuRanker is a standalone keyword rank tracking software, dedicated to delivering the most up-to-date and accurate rankings data. It has all the features provided by the other tools in this post, but its key differentiator is providing on-demand keyword rankings data. AccuRanker is the third choice in our poll with 6 votes. This section calls out 8 features (in no particular order) the experts found most valuable in a keyword tracking tool. Accuracy, along with frequency, is critical to keyword tracking. There’s little point monitoring old data, so our experts want rank tracking software updated with the latest rankings on a regular basis. In most cases that means daily updates. But with standalone tools like AccuRanker and AWR Cloud, you also have the ‘on-demand’ refresh feature, which means you always have access to the freshest rankings for your business and/or clients. Experts also look for software that offers the right level of tracking. While high-level dashboards are useful, they also need tools that provide granular details. For instance, is it possible to differentiate data between mobile and desktop, track rankings at different geographic levels, or compare results from Google, Yahoo, and Bing? Keywords perform differently across devices as they serve different audiences. So having a tool like SEMrush which lets you track and compare keyword positions for desktop and mobile is essential. They also want the ability to choose to track keyword rankings at country, state or city level, maybe even as far as postcode and address, so they can serve local and international clients. Rankings are continually fluctuating, so it’s crucial to be able to track performance over time. Software that distributes keywords into groups or buckets by position – e.g. 1-3, 4-10, 11–50, etc. – allows you to track historical progress and compare keyword rankings against competitors. When you’re tracking thousands of keywords, you need a way to segment your data. The experts prefer tools that allow you to tag/label keywords individually (or in bulk). For instance, tagging helps you monitor keyword performance through different parts of the sales funnel. Using the results, you can adjust your content to fill content gaps and/or better match search intent. AccuRanker lets you add notes and dates along with your keyword tags, which is useful for cross-referencing position changes with content and algorithm updates. And Ahrefs includes a feature where you can view aggregated data for a specific tag. So, for example, you could tag your brand keywords and monitor ranking/visibility trends across that segment. Similarly, if you wanted to track performance across top, middle or bottom funnel terms, the tagging feature would enable this. Experts pay particular attention to keywords that have SERP features, including featured snippets, image packs, knowledge graphs, and direct answers. Ranking in featured snippets is one of the fastest ways to increase your organic traffic. So, tracking how many terms you have generating snippets can help identify short term opportunities. A sudden rise or fall in traffic could be down to gaining or losing a SERP feature on your keywords, so it pays to monitor them closely. And according to our experts, the ability to inform clients that they’ve won more featured snippets is a big win. Both Ahrefs and SEMrush allow you to map keywords to SERP features. 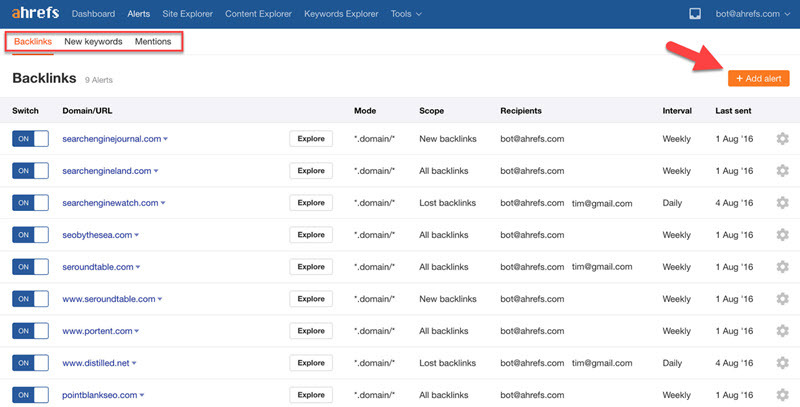 For example, Ahrefs Rank Tracker can alert you to keywords that have either gained or lost SERP features. Using that information you can prioritize content improvements to ensure you keep hold of the SERP feature, or regain them from competitors. You can also easily filter the results to see which specific keywords you already rank for in the featured snippets, and which ones you don’t. Experts valued software that allows scheduling of ranking alerts. For example, you can configure Ahrefs to send weekly or monthly alerts via email highlighting changes in rankings, lost and gained SERP features, and performance trends across keyword tags. You can also click through directly from the email into the application dashboard to investigate further. Some tools will also create custom alerts that are triggered by an event; for example, when a tracked keyword enters the Top 10 or drops out of the Top 20. Tracking keyword rankings is one thing, but reporting on progress is another. Stakeholders including clients usually want easy-to-read weekly or monthly reports. And to achieve that, the consensus with our experts is that it’s better to integrate with third-party reporting tools like Google Data Studio or Agency Analytics. Google Data Studio lets you convert your data into branded, informative, and interactive reports by connecting and pulling the keyword ranking data from tools like SEMrush and AccuRanker. Agency Analytics offers real-time dashboards and custom reports with charts and graphs, which gives clients an up-to-date visual summary of their keyword rankings. Check if your software can integrate with third-party tools, or if there is a connector for a tool like Supermetrics. Google is updating and tweaking their algorithm every single day. This often results in ranking volatility across certain industries. A tool like SEMrush’ SERP Sensor shows you how volatile the SERP was over the last 30 days. If you see high volatility on a specific day and notice it corresponds with a rankings and/or organic traffic drop, it could be a sign that your site was impacted by an algorithm update. These insights can help you pinpoint the issue, and put a plan in place to minimize damage. You can also sign up to receive email alerts when there is high SERP volatility. AccuRanker also provides a similar report through its Google Grump rating. That’s a quick recap of the top keyword ranking tools (and features to look for). Now it’s time to dive in and find out how the experts are using the different tools to monitor keyword rankings and track organic search visibility across the entire funnel. AccuRanker has recently become my go-to tool for tracking keyword rankings. They’ve got a lot of the same features I was already used to getting elsewhere – daily tracking, city level data, and mobile/desktop results. However, the thing that really got me using them heavily in the last month or two is their Google Data Studio connector. I’ve moved my client reporting, as well as the dashboards for my personal projects into Google Data Studio. Rankings were the one piece that was still really muddy. Relying solely on Google Search Console data was less than ideal, because it’s not a good solution for defining a set of terms and tracking progress against those over time. Combining the tag feature, as well as the Share of Voice metric from AccuRanker’s been a big help in making these reports immediately digestible. Share of Voice by tag gives a quick glimpse into the overall health of a particular keyword set. I’ve found this especially helpful for clients, as it reduces the feeling of being overwhelmed by rows of hundreds of terms, but doesn’t have the noise of an “Average Rank” metric. Average Rank is, more or less, garbage. You can rank well for a bunch of terms that get no search volume and artificially boost an average rank metric. You can also drop from #1 to #3 for a huge term and barely move the Average Rank for a bucket of terms, never mind the whole site. Share of Voice within AccuRanker is more or less a click estimate (though I don’t know that they claim that anywhere.) If you export and divide SOV by Search Volume, you can see the assumption curve they use. I like this a lot because it gives more weight to small movements within the top positions for high volume terms, and significantly less weight to stuff that’s moving around on page two and beyond. It only really moves when something important happens. So, aside from the normal stats like terms by page, etc I can now roll in Share of Voice reporting and break it out by tag, all automatically updating in Google Data Studio reports. My favorite keyword tracking tool is SEMrush. The feature that first attracted me to it was the ability to segment rankings by country. I typically deal with clients from around the world, so this is a must-have. Another feature I love is the historical data for keyword rankings. It’s really powerful to be able to identify trends early and prioritize struggling keywords. The final thing I love about SEMrush is the ease with which I can view country-specific SERPS for keyword rankings. I can easily scope out the competition and craft better content. For tracking multiple client rankings, I use SEMrush. I love being able to track between mobile, desktop, internationally as well as via state or city. SEMrush has a great visibility map of you vs your competition. The results are refreshed daily, and they make it easy to export client reports and drill down on things like featured snippets or videos. I don’t think you can go wrong with any of the top choices like Moz or Ahrefs, but If I had to pick one it would be SEMrush every time. My favorite rank tracker is SEOmonitor because it allows me to track my client pages positions vs competitors daily for both mobile and desktop search results, including the existence of search features and inclusion in them, providing the impact in traffic and conversion with the integration with Google Analytics; as well as suggesting potential reasons of rankings decrease. I like rank trackers such as SEMrush or Ahrefs for a couple of reasons. First, I think it’s important to track a custom keyword set and a general one to assess and track your site and competitors. Second, it’s very important to build your own keyword index, meaning a set of keywords that reflect your industry – not just the keywords you’re ranking for. Ranking factors seem to be more and more adjusted to industries. So, if you’re not tracking those keywords and check how rankings for them change over time you lose a feeling for what’s important. Third, you need to track SERP features like featured snippets, knowledge graph integrations, or direct answers. That will help you figure out why organic clicks spiked or dropped – something search console can’t tell you! My main tool for tracking keyword rankings is STAT. Although the UI takes a little getting used to, the granularity in tracking and ability to create organized tags and generate dynamic tags makes it my go-to for accuracy over time. Their reports also offer tons of opportunities for competitive & content gap research, and scheduling is a breeze which I love. The only drawback to STAT is that you’re paying for each keyword you track – however that’s why I temper a tool like STAT with one like SEMrush or Ahrefs. STAT is far more accurate, but SEMrush or Ahrefs is great for directional rankings and ideas for keyword expansion since it returns all keywords ranking to a site/URL, rather than just the keywords you’re tracking. At the moment we use a mix of methods for tacking rankings. These include using SEMrush, Ahrefs, SERPbook and Google Search Console (average rank). In the past we also used AWR cloud. Ahrefs has definitely impressed in terms of updates in the past year, but we do still need to cross check with Google Search Console on some commercial head terms for clients. Ahrefs ranking alerts are useful, SERP features such as featured snippets rankings are also very useful. Ahrefs Rank Tracker – Ahrefs Rank Tracker is ideal for finding opportunities to compete in SERPs. It alerts me every week to keywords that have either gained or lost SERP features, and with a few clicks I can filter the report by my target features, check their search volume, then export the report to send to my clients to help prioritize projects. For example, I use it to keep tabs on when my clients competitors are using Google Ads to compete in SERPs. This allows me to recommend pivoting to paid ads when necessary. My favorite by far has been Agency Analytics. It has a clean, easy to use UI, and the ability to create customized, white-labeled reports that run as scheduled and are delivered to clients automatically, saving me a ton of time. It also lets you set-up rank tracking to check rankings from a specific location (or many locations, both country and city-level), which is extra helpful for local SEO or clients with an international presence. Last but not least, it integrates with what feels like everything under the sun (GA, GSC, GMB, CallRail, AdWords, Facebook, etc. ), allowing me to pull in more granular data from different sources that can paint a more complete picture of what’s going on. I’ve been using them off and on for clients for the last 7 years and couldn’t imagine using anything else. I have two favorite tools for tracking keyword rankings and reporting data: Agency Analytics and Ahrefs. Ahrefs is extremely useful as a granular analysis tool for keyword metrics. They are very strong when it comes to generating multi-faceted data for keyword research. Of course, you always want to know keyword volumes, difficulty, and similar phrases to rank for, but Ahrefs takes it much further with paid vs. organic click metrics, SERP features (which show you how Google is displaying content for any particular phrase), and their Questions feature (which is an invaluable tool for managing a long-term content strategy). Their visual approach to representing the data (in graphs and charts) is also very intuitive. However, one of Ahrefs’s drawbacks is that the reporting interface just isn’t the best for client-facing tasks. Agency Analytics, on the other hand, is an excellent tool for client-facing reporting. They have a mobile dashboard, custom reports, the ability to showcase local SEO data, and great data visualizations (i.e., charts and graphs). Their interface is much cleaner, which is helpful for clients who might get overwhelmed by an abundance of granular information. Automated reporting features are a huge time-saver as well. For reports that can be standardized from month to month, it’s much faster to automate them than to have a team member manually organize information for client reporting. I want to clarify a few things before I give you an explanation for why I prefer to use AccuRanker. Normally, I try to stay away from tracking keywords since this metric doesn’t really say much about how well you’re doing SEO. From my experience, it makes much more sense to look directly at Google Analytics regarding the growth of organic traffic and whether or not that is hitting the predefined goals. 1. I want to evaluate the current level of competition in a particular niche/industry in different countries by the most important. AccuRanker is the best choice for this sort of analysis since it gives you results within a few minutes. After this, I can check each and every SERP manually. Here’s a great post by Aleyda Solis that shares more cases about how and why you need to evaluate the competition before starting to expand your SEO efforts to other markets. 2. I need to check which set of keyword pages are ranking in the top 20 results in Google and whether there’s any chance I can improve the situation with internal links. With the help of filters in AccuRanker, you can build a report where you can see the list of search queries showing how a page you’ve analyzed appears in Google. Personally, I’m not paying extra bucks for a specific keyword tracking tool. With that said, I’m using the Ahrefs Rank Tracker. If you’re an Ahrefs user there’s no reason for you to spend more money in an additional tool just for SERP tracking. Ahrefs has a very clean and easy-to-use dashboard, and the same applies for their keyword tracking tool which comes inside your regular Ahrefs account. The Ahrefs Rank Tracker allows you to easily create different dashboards based on your different projects/websites. Another useful feature is the keyword position alerts, so you can receive an email notification with the keywords position changes on a Weekly, or Monthly basis. I’ve been using it for a few years now and it gives me a clear overview about everything I need to know about my SERP presence. It’s good to mention that Ahrefs’ team is constantly improving their tools with new cool features and updates. Last but not least, If you’re not an Ahrefs user and you’re looking for a keyword tracking tool, here are 3 great options that deserve a mention: SERPWatcher, SEMrush, Google Rank Checker (Free) and SERPROBOT (Free). I use SEMrush, because I can see at a glance how our rankings are changing for dozens of keywords. The graph of overall rankings over time is also useful in reporting progress (or lack thereof) to other stakeholders. That being said, I’m not a fan of obsessively checking rankings. As the CEO, I really only need to see them about once a week or even less. I’m much more interested in tracking the execution of our strategy to rank a given post. For example, internal links created, outreach emails sent, shares by key influencers, and so on. Those are the leading indicators of ranking, and I can reallocate resources based on progress. In other words, the data helps make better decisions about how we spend our time and money. SEMrush is a great tool for tracking your keywords. I enjoy using the dashboard and that the platform has a diverse range of other metrics and information you can access. I have used rank trackers in the past that only track keywords which means you need to access multiple platforms to dig into your campaigns and you can track competitor rankings alongside your own. I have also found SEMrush to be very accurate compared to other platforms. I like to cross reference the data with the averages found in Search Console as well. Because after initially setting it up with the right tags, it gives me all the insights I need to keep track of ContentKing’s SEO performance and that of competitors, and more. When you’re tracking thousands of keywords, it’s essential to use tagging otherwise you can’t see the forest for the trees. They’ve got a handy feature where you can use tags as a dimension to look at your rankings. You’ll see aggregated data for all keywords with a certain tag, so you can easily see the big picture. Ahrefs automatically puts rankings in buckets, so you can quickly filter on keywords ranking in top 3 for instance. You can also quickly switch between desktop rankings and mobile rankings and you see what features are present in the SERP at a glance. Under ‘Metrics’ they’ll show the split between SEO and PPC clicks, as well as what percentage clicks on a result rather than leaving without clicking. Very useful information when you’re gauging keywords’ potential. I’m partial to AccuRanker. It’s a great value for the cost and very fast. The instant refresh feature means I always have access to the most current information for our clients. I also appreciate the ability to check both local and global rankings, as well as the number of tools and technologies it integrates with out of the box. First, we’ve found the tool more accurate than others. Second, we can get the rankings of large keyword sets relatively quickly (same day) with accurate search volume estimates from Google. Other tools we used in the past might run the rankings once per week or in the case of some backlink tools, less often than that. Day to day, that’s not going to get the job done. And third, the clients we’ve worked with long-term are ranking highly so seeing which rich snippets we’re winning is a great feature for our regular client calls. The Accuranker team also works to improve functionality and has updated the look of their reports, but frankly we haven’t seen a need to use these, though it’s a good sign the tool is being further developed. While I use a variety of tools to track keyword rankings, SEMrush is my all-time favorite. There are a few unique features that come to mind, including the ability to monitor keyword visibility trends over time, easily understand SERP features, and access granular data. Keyword visibility trends: From my experience, one of the most common hang-ups when it comes to reporting on keyword performance is that rankings are constantly fluctuating. Google is always changing and updating search results, causing keyword rankings to vary day-to-day. What’s important is being able to track keyword visibility trends over time, and SEMrush does a stellar job with this. Comprehensive SERP analysis: For each keyword, you can easily dig into what SERP features are appearing to help guide your content development efforts. For example, there may be a Featured Snippet or Answer Box appearing for the term, which presents an immediate opportunity to create a question-based article. Or, there may be reviews appearing, which requires an entirely different strategy. Granular keyword data: Last but not least, I’ve found SEMrush to have more granular and accurate keyword data than other third party tools. The key metrics that I need include position, ranking URL, estimated CPC and search volume. I’ve tried dozens of different keyword tracker tools over the years as I’m always on the hunt for better tools, and none of them compare to Accuranker. In my opinion, it’s by far one of the best on the market. 1. Keyword updates on demand (instantly) as I’m auditing content are crucial. A lot of times I’ve updated a particular article with more content, re-crawled it, and I need to see updates quicker than a few days later. Google is very fast in terms of recalculating positions. 2. Ability to tag keyword(s) with notes along with specific dates so I can keep track of changes. Make a bunch of tweaks to a post? Perhaps you change the title, headers, etc., and want to see if it impacts the ranking. Jotting them all down in a note can make sure you attribute the change correctly. Correlate your notes with the up or down movement in SERPs. 3. Accurate monthly search volume. This is very important! Search volume changes over time and being able to see this ensures you’re optimizing for search volume. The opposite can also happen, sometimes more long-tail keywords might drop off the board altogether, in which case, it might be better to optimize them for something else. Preface: I should lead with the fact that I HATE keyword tracking. It’s a useful directional tool in the hands of a reasonable SEO pro, but it never stays there. In the hands of those with too much power and not enough training/experience, keyword rank tracking can be disastrous for a business. All keyword rank trackers suffer a fatal flaw: manually maintained keyword lists. The organic search universe is not static. As long as we keep talking about these lists, we’re stuck in the past. Why: Flexibility. I’ve never encountered a tool as flexible as STAT. The tagging functions – manual and auto – allow for an incredible amount of insights and trend identification. The reporting is flexible, the API is incredible, and provides more information than any other service. Who else lets you snag the whole SERP HTML through an API call? You can get basic keyword tracking damned near anywhere – Moz, SEMrush, Ahrefs, etc. – but if you want deep insights, go to STAT. My favorite rank tracking tool is SEMrush. I know there are many other tools out there, but in terms of keyword data I think SEMrush have been the leader for many years and are constantly striving to improve their tool. For agencies, the fact you can get API integration for Google Data Studio to do custom reporting is excellent. But the real reason I like it is down to the accuracy of the data, that is massively important to me, but you can also brand the reports using SEMrush too, which is simple and easy to do. Ahrefs is definitely my favorite. I’ve used a lot of tools, and there are lots of reasons to use some of the new ones in conjunction with Ahrefs – but if I was going to pick just one – that’s the one. My number one reason for this, is because it’s the most accurate of all of the different ones that I’ve tested. It goes without saying, that accuracy is critical to keyword tracking. The second reason why it’s still number one for me is because the UI is the most thorough and easy to use in my opinion. I don’t have time to dig through a clunky UI – and Ahrefs has enough users that they’ve figured out a way to streamline things for people that know SEO. My go-to keyword ranking tool is now SEOmonitor. It’s great for individual keyword monitoring, but it also allows me to track keyword groups in a campaign format – highlighting group rankings and keyword group visibility and scoring the difficulty of ranking for a specific keyword (based on competitor research). It integrates with both search console and analytics to provide key data such as search volume, clicks, revenue etc. and has a built in forecasting tool which allows you to forecast traffic and revenue performance of keyword groups (based a projected ranking position). On top of this there’s a handy alerts tool / app which will inform you when rankings / site visibility increase or decrease. I like using SERPWoo because they do not just track your websites rankings for a keyword. They track every single domain ranking in the search results over time and keep it in a database for you. This feature allows me to quickly see competitors who start to surge upwards in rankings. Then I can try to reverse engineer what they are doing for my own sites to improve rankings. My absolute favorite tool for rankings is Ahrefs. Whenever I compare their index to others, their data is always the most recent and closest to what I see when I manually spot check rankings. In addition, Ahrefs allows me to do some real cool deep dives on rankings so I can see specific ranking URL’s and the type of ranking that I am getting. We use SEMrush for tracking keyword rankings. Their ‘Position Tracker’ overview dashboard enables us to quickly take a snapshot on their visibility (rankings) against competitors. 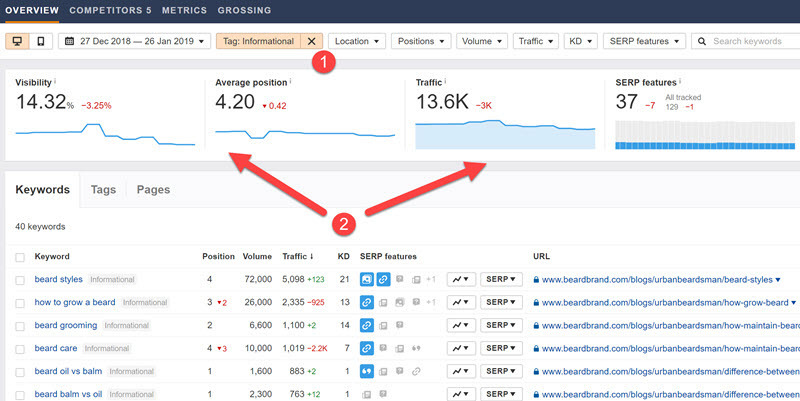 Obviously keyword positions are very important, but it’s more important to utilize the ‘Estimated Traffic’ graph because higher visibility doesn’t always equal more traffic (depending on keyword search volume of each keyword). We use the ‘Organic Research’ tool to track keywords for specific pages. This becomes quite useful when we’re optimizing a page, we can review which long tail keywords and variations we must consider. One of my favorite tools for tracking rankings would be SEMrush. Even with actual rankings fluctuating SEMrush has, historically, had a pretty accurate representation. It is great to be able to see where a site ranked for a term 6 months ago. I also really enjoy the ability to pinpoint queries that bring back featured snippets. The rank tracker I currently use is SERPROBOT. I like it because the UI is simple, and it’s super cheap. The primary feature about it that I like (that I didn’t have with previous rank trackers) is that I can look at an entire domain and see an average for all the keywords I am tracking, and also a weighted average. These two metrics help me understand how the general “group of keywords” I’m tracking for the page is trending. It’s a quick snapshot that tells me “is this page as a whole improving or not”. Also their notes feature is handy – very similar to Google Analytics annotations. Surprised more rank trackers don’t have this. I use Google Search Console (GSC) combined with Search Analytics for Sheets and Google Analytics. With Search Analytics for Sheets, I pull out the data from GSC and map in the spreadsheets alongside the other relevant data that I need for making certain decisions. E.g. Google Analytics data – Goal Completions from “Acquisition>>>Search Console>>>Landing Pages”. From there I can see the clear correlation between the impressions, positions, clicks and goal completion. That gives me ideas how to better optimize the page and on what to focus first. I also like using filters in GSC such as data from a specific country, device, etc. Comparing dates as well so I can see how updates impacted or changes in the title made sense in terms of CTA. There is a lot of ways you can use the provided data. I have found SEMrush to be one of the most comprehensive, accurate, and actionable keyword ranking tools. Not only can you view real-time ranking data of a given website, but you can also include competitor domains. The tool also shows which URL of a domain is ranking for a given search term, as well as more granular insights like if a piece of content is ranking in Google’s featured snippet, image search results, etc. Because SEMrush is far more than just a keyword ranking tool, the platform also comes equipped with a lot of valuable tools to help pinpoint site health issues and precisely how to fix them. I prefer STAT for keyword tracking because of their ability to calculate Share of Voice (SoV), a metric that allows you to see which competitors are owning the most market share for keywords important to your business. This is calculated based on click-through-rate (CTR) and search volume. However, STAT actually allows you to upload your own click-through-rates so you can estimate what gains/losses you could see should you increase/decrease your marketshare for a particular keyword/set of keywords. AWR Cloud. It’s the tool I’ve used for years and it allows me to easily track hundreds of keywords easily over time. Plus, I can group keywords and see how individual blog posts are performing overall for a collection of keywords. Love it! Currently, we’re using SEMrush for our keyword tracking, although we may be transitioning to Ahrefs. What’s nice about SEMrush’s tool is it allows a pretty seamless transfer from the Keyword Magic tool, which we use to generate keyword ideas. I’m sure Ahrefs has a similar feature. We’re thinking of using Ahrefs mainly because SEMrush doesn’t allow you to input a long list of seed keywords, which is disappointing. So at the moment, we’re a bit on the fence. The one thing I don’t like about SEMrush’ tracking is that it’s hard to get a read on your success over time, as you’re always adding new keywords, which means your overall visibility rate doesn’t go up (you’ve always got old and new keywords.) This may be user error on my part, but it’s where we’re at. My favorite tool for checking keyword rankings is Ahrefs Keyword Explorer. 1. “Parent topic” feature – shows you the pillar topic you can create as a pillar content on your website (topic cluster model). 2. “Questions” filter – easily see “what”, “how”, “why” and other question-type keyphrases you can target for your content. This is best to integrate to your content creation campaign, as you can produce pages just targeting question-type keywords. 3. Filter keywords by “SERP features – allows you to see which keywords have many features in their SERP or identify keywords which have a very specific feature. We still use SEMrush more than any other tool for monitoring, tracking, and reporting of keyword placement. The ability to segment rankings by page placement and date are particularly valuable. We also regularly utilize the filter feature to exclude branded terms from our ranking reviews. The traffic and trend chart is also great because it helps us see where things are headed. First, value for the money. You can pay more for a tool with more bells & whistles, or pay less for a more bare-bones tool. But few alternatives can compare for this level of capability and price. Second, it makes it easy for me to monitor both improvement (or not) in rankings over time as well as comparison to competitor websites. Finally, as a digital marketing consultant who monitors multiple client sites, I appreciate the ease of setup for multiple sites and competitor groups, comparison, and data export. Search Console – Now that Search Console can provide me with upwards of 16 months worth of data/information, it has without a doubt become my favorite tool for nearly everything, not just keyword research. I prefer SC, as it allows to me see exactly what organic search queries are being made, and from that I can make adjustments to content, meta descriptions and title tags to encourage better CTR. Or for paid search, I can help provide them a list of low-medium competition phrases they may not have been targeting before, and could help improve conversion rate. The interface is fresh, friendly and fast to navigate. And best of all most dashboards like SEMrush allow you to sync up with Search Console. The tool provides ranking updates daily, weekly and on demand which is important due to the fast changing pace of client expectations and last minute reporting requests. The tool provides data on mobile, desktop and even local geo-targeted results from Google, Yahoo, and Bing. My team loves the white label report reports which makes it easy to provide concise and easy to read reporting for our clients. The dashboard is also accessible from any device which is incredibly convenient for on the fly data. The tool allows you to segment data based on top 5, top 10, and top 20 rankings, which presents powerful opportunities to adjust content, paid, and on-page strategy based on these results. SEMrush is currently on top of its game. The tool has come a long way over the last decade, and it can do a bunch of high-value SEO tasks and offers a bunch of high-value SEO data and resources. It’s simple enough to be able to learn your way around for all marketers, from analyst-level to intermediate SEOs right to the top. The platform itself offers some of the best features on the market, and its organic keyword tracking is one example of that. For each keyword, it doesn’t just offer the rank, change in rank, estimated site traffic, visibility numbers, URL, and search volume; it also offers details for each triggered SERP feature (local pack, Knowledge Panel, featured snippet, reviews, images, video, site links, People Also Asked, PPC ads at the top or bottom of the SERP, etc.). The most commonly criticized aspect of SEMrush is usually cost, but if used correctly for the right size company and clients, it can make great sense for your business — for organic keyword tracking, but also for a lot more. There’s a lot of great tools available for tracking keywords, so it’s kind of splitting hairs — whatever works for you and keeps you organized is ultimately your best option. I’ve used Agency Analytics for years because it does exactly what I need for my reporting. What I particularly like about it is the interface is very clean, there’s not a ton of extraneous features just for the sake of billing you more. One feature I really like is the ability to create a dashboard; you can provide your client with access and provide real time reporting with it. If you’re looking for an easy way to build campaigns and report on keyword movement, Agency Analytics is a solid option. For keywords, it’s a two-fold kind of thing. You know there’s never just one tool that does it all, and all of them have strengths and weaknesses. We use MOZ because placements are accurate. -And, with the keyword tool, we can put in the site or a page and find terms they’re ranking for that we didn’t even know about – gives opportunities to find those golden terms. I like the dashboards as well. However, we also use SEMrush. Placements aren’t as accurate, but it has a really strong keyword dashboard. The same information is provided by MOZ (CPC, keyword difficulty, ranking, etc), but laid out in a much easier way. Less hoops to jump through. One feature that I really like in SEMrush that isn’t in MOZ is the keyword graph. It gives you a line/bar graph showing your site’s overall number of key terms in the top 100, and notates whether there was a confirmed Google Update or just a lot of activity. We’ve found that very helpful in understanding how our overall rankings are doing. Our favorite keyword rank tracking tool is AccuRanker. We’ve been using AccuRanker for years and it has helped us create accurate reports for our extensive list of clients. The reason why AccuRanker is a great tool for tracking keyword rankings is because their UI allows us to access different data sets with minimal clicks. From share of voice to estimated clicks per keyword, AccuRanker has everything we need. Another feature AccuRanker has that not many rank tracking tools have is their Google Grump rating wherein they notify users if Google rankings are fluctuating at an abnormal rate that can signify an algorithm update or just normal movement for our rankings. Conductor Searchlight is my favorite interface. The way it layers opportunities and extracts handfuls of low-hanging opportunities is impressive. But since it’s tough to justify six figures a year and not get a lot else in return, it’s between SEMrush, Moz, and SEO PowerSuite. SEMrush for reliable daily tracking, Moz for tracking new SERP features, and SEO PowerSuite for when you need the data faster and in much more robust reports than all of the above. Ahrefs is my favorite keyword ranking tracking tool. My favorite part about Ahrefs’ keyword tracking is that it includes the vital information you need, and makes it very easy to one click filter from biggest to smallest using any data column. In addition to showing you the volume for each keyword, which is key, it shows you the traffic that keyword gets and what page gets the traffic. Lastly, and the feature I find most helpful, is it shows you the ranking of each keyword, including recent up or down movements, so you know if improving it would make a huge difference or not. 1. Simple dashboard (no complicated nonsense). 2. Able to see all clients in one screen by expanding keywords (don’t have to change screens per client). 3. Focuses on rank tracking ONLY. Again simplicity. Ahrefs is by far my favorite. Although the price is “high” relative to some other all-in-one tool sets, I have used this tool to find articles that make me much more than the monthly payment. This tool is fantastic if you have an existing blog, as well with content that could be optimized. My favourite ranking tool is SERPWatcher. It‘s accurate and has the regular things like keyword tagging and filtering. What sets it apart is its elegant design and split screen. On the left side, you get the granular keyword ranking data, and over on the right, it’s the higher-level stuff which makes for a great user experience. At a glance, it’s easy to zoom in out, so you can see how your SEO is progressing over time. This includes the ‘movers and shakers’ keywords, how they impact your predicted search volume, and it also predicts the market share you are currently are receiving as a handy percentage. As part of the Mangools SEO ecosystem, it seamlessly integrates with (1) KWFinder which provides more accurate search volumes than Google Keyword Planner and is easier to use (2) SERPChecker which is a great tool for competitor research and real time global ranking checks, and lastly (3) LinkMiner which pulls in some useful backlink data from Majestic. One of my favorite tools for tracking keyword rankings is SEMrush. I find the data most accurate in this tool, as well as the placements I can track for my content. For example: under Organic Research in the Organic Search Positions, I can see at a glance hundreds of content pieces ranking for exactly what keyword, and click the arrow to expand and open the exact blog URL in a new window. If I stay in Organic Search Positions and click the keyword to expand the data, I can also see what SERP features our content piece is showing up in – sometimes it’s a Featured Snippet (and might be a higher priority to update, if it contains irrelevant or old info), News, or Google Images. Super useful to have on hand all from one dashboard, which is why I love SEMrush so much. I go here frequently to look for content to update and maintain, so we continue to position our brand and content well in the SERPs. I like using their Rank Tracker function to see how certain keywords are performing on desktop vs mobile, and tracking the SERP ranking over time. Their top keywords feature is also helpful to see which words you may be gaining on that you didn’t anticipate. Combined with its research functions, Ahrefs is the best tool for SEO. Ahrefs is my favorite tool for tracking keyword rankings. Their Rank Tracker is pretty solid. Among the things I like about it are the filtering capabilities, tagging options, and SERP features information. The filtering options are excellent. I can easily filter by date range, ranking positions, search volume or even custom tags. Speaking of custom tags, the tagging feature is really useful in that you can tag/label your tracked keywords to identify brand, top of funnel, bottom of funnel keywords. This is helpful in really understanding what parts of the sales funnel are doing well. And the third feature that I find really useful is the SERP features option. This allows me to easily see if a particular keyword is ranking for things like a featured snippet, image pack, or even a knowledge card. These three features along with everything else Ahrefs has makes it my favorite keyword tracking tool. BrightEdge, the reason I love using this tool is because the depth of insight into keyword rankings goes beyond just what position we are in. We can easily compare against competitors, see historical data, get specifics on which page we are ranking for each keyword and even forecast what kind of traffic we could expect should we rank in a higher position for specific keywords. Another feature is being able to see recommendations for improvement to help increase our chances for ranking a keyword on a specific page. For smaller scale websites, I typically use the rank tracking tools within other SEO software I already use. I’ve been happy with the dashboard provided in Ahrefs and SEMrush to track specific keyword phrases that are the most important. You do have to upgrade your subscription to a higher level if you want to get past historical rankings instead of just tracking the rankings going forward once you input the specific keyword phrases. For larger scale sites, I recommend using SEOprofiler since it is a standalone tool, and as such, has more functionality like a nice visual view, integration with Google Analytics, and suggestions for your site based on tracking your competitor’s rankings. SEMrush is an effective tool for tracking keyword rankings, and it’s my personal favorite. It goes in-depth and tells you your national, regional, and local search rankings for any keyword. The data is updated on a daily basis. You can also track the rankings of up to 10 competitors and make direct comparisons against your ranking. The tool also has a Competitors Discovery feature that shows you the local competitors that are ranking in Google’s top 100 search results for your target keywords. 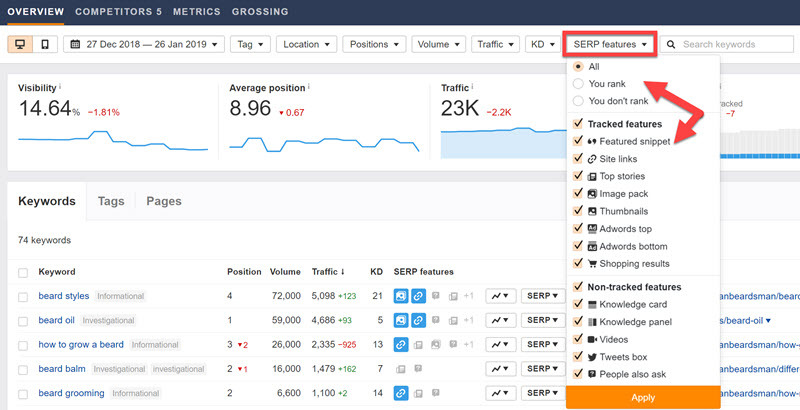 The Position Tracking dashboard also shows various metrics like estimated traffic, average position, and domain visibility, for every keyword that you’re tracking. At Page One Power, we love using AWR Cloud for granular tracking of a single keyword or small set of terms. The Visibility Score provides a quick check to see trends and understand how your site is performing in regards to specific keywords and themes. For a more holistic and high-level view of keywords and a website’s overall performance, we rely on a combination of Google Search Console and SEMrush. Search Console is an excellent source of keyword data for your own site, straight from Google. And SEMrush is best-used for competitive research and tracking keyword rankings for your top competitors. I’ve used lots of tools to track rankings during my time in SEO, but my favorite is Ahrefs. With it I can not only see the ranking, but I can see key stats associated with those rankings that give me context about the value of those rankings. For example, I can see search volume, keyword difficulty, position change, referring domains, and other metrics like CPC, traffic estimates based on click data, how I fare against competitors and the parent topic of my keywords. I can also filter my results by SERP features I rank or don’t rank for and much more. I am a big fan of simply looking up my site in Site Explorer to see everything I rank for and how they’ve performed over time. Ahrefs gets my vote! Here’s more on why. Microsite Masters has been my go-to ranking tool for several years. I don’t consider their UI great but if you are looking for a professional and cost-effective ranking tool you should consider it. They also offer a free 10 keyword tracking account, so you can test it out yourself. – Fast daily ranking updates (the basic account offer 1,500). – Ranking graph for individual keyword over time (see how ranking fluctuates). I use more than one really good keyword tracker so I can cross-check data. And each one does something a little different and sometimes offers insights the others don’t. I use Ahrefs, SEMrush, and Moz as my keyword trackers. I also dig into Google Analytics and Webmaster tools to determine what keywords are already driving traffic and leading to conversions. I use Ahrefs to find new opportunities. I like it provides data on keyword difficulty, search volume, and traffic potential. SEMrush has the largest keyword database on the market with their Keyword Magic tool (9.4 billion keywords to play with). That sounds overwhelming, but you can easily segment by topic and analyze a list of collected keywords to choose the best ones. It’s great for gathering ideas for content strategies. And, finally, I use Moz to track keyword rankings and compare them to Ahrefs. Moz also offers quick on-page analyses that are great for people who are just getting into SEO who want a little guidance. SEMrush has many great features although I feel some of them need some work. I find their keyword tracking to be one of best and fits all of my needs while, being cost effective. The UI makes it very simple to track historical data on desktop and mobile with relevant Google updates marked. The frequency of the updates is also very important where you can see top position changes for your website daily. The most important factor that also goes along with frequency is accuracy of data. I feel that SEMrush gives a decent estimate where you can make informed decisions based on the keyword tracking data. Whether it’s tracking your own site, a competitor site, or looking to see if a site ranks for any related keywords that may be a good fit for a guest post opportunity. 1. Organic keywords report. This allows me to see which organic keywords our competitors are ranking for and create “skyscraper” content, often from a unique angle (thus, bridging out content gap). 2. New keywords report. With it, I get an email once a week with new keywords our competitors are ranking for. Plus, blog post topic ideas I wouldn’t have thought of otherwise. 1. The UI is clean and straightforward. 2. The tool allows you to check SERP rankings for both mobile and desktop platforms. 3. The tool allows you to check for 10 keywords at a time. 4. There is no conventional dashboard. Just a list of tools that you can switch back and forth from. 5. It is completely free. If you are just starting out and you don’t have a ton of money, SmallSEOTools is a safe and reliable bet for you. The only downside is that the process is entirely manual and the limit on 10 keywords can be a bit frustrating if you have a lot of pages. If you have a fat, juicy, budget, then by all means – go for paid tools. But if you are just starting out, especially in a non-US region, I’d recommend SmallSEOTools without a second thought. This will be a two-part answer depending on what exactly you’re trying to track. For general/national-level keyword tracking, most tools in your arsenal will work. I actively use both SEMrush and Ahrefs, simply because they both have the functionality and I have accounts with both. They do the job and it’s convenient to use the functionality of a tool you already have access to for other purposes. For local rankings, on the other hand, I’m a big fan of PlacesScout. It allows you set location-level tracking to see how you show up in searches that take place in a specific location. This is obviously what you want to see when you’re tracking local rankings (and it’s extremely useful when tracking for companies with multiple locations). SEMrush. It is one of my favorite tools. All you need to do is to enter website URL and it will show you which keywords you are currently ranking for. You can structure the report based on the amount of traffic you get, keyowrd difficulty, average monthly searches etc. Data from Google is updated daily so it provides very detail and accurate report. It’s not the best looking UI in the world but I find the functionality is exactly what I need. 1. I really like their backlink report as it’s better than the others I’ve tried in the past. It’s really comprehensive and helps me target people that have removed our links. On saying that, sometimes it shows up links that haven’t been removed but I can work with that. 2. Their competing domains and pages report is amazing. I love being able to see what our competitors are up to. I really like that I can click through the results and get excellent granular data. 3. The 3rd feature I love is that they split organic and paid results so that I can see exactly what our competitors are chasing and how much they are spending per month. What Tools Are You Using to Track Keyword Rankings in 2019? There you have it – 65 SEO experts revealed the tools they use to monitor keyword rankings for their business and/or clients. Which tools are you currently using? Any new ones that deserve a mention? Any new ones you’re going to try? We are using MSM and SEMRush right now. But after getting a brief knowledge about the other rank tracking tools, I would like to experiment with the other ones as well. I guess other tools have more insights than MSM. My Favorite is Semrush. Its dashboard provides all information on which keyword you are ranking along with its historical data. Also, it updated data from Google on a continuous basis so you get almost perfect results. Great piece of content Robbie! I love using Ahrefs but finds it can get quite pricy. Something I’ve been using lately which I’m loving is Rank Ranger! Daily tracking of keywords and I do find it to be accurate. Not sure if anyone in the community has used it before? Thanks again for the value. Thanks Jandre! I haven’t used it before. But, have heard it come up a few times now. Appreciate the suggestion. Thanks for putting all the info into one post- along with having experts’ opinions it makes it easier to narrow down the options. Do you think it is a good idea to use more than one and compare results? Or do you (and the experts you mention) rely on one tool? Hi Jen – unless you have a large marketing budget, I’d recommend using one of the all-in-one rank tracking tools. Either Ahrefs or SEMrush are really solid, and provide a host of other awesome tools to support your broader marketing efforts.